Look out, super glue and paint thinner. Thanks to new dynamic materials developed at the University of Illinois, removable paint and self-healing plastics soon could be household products. 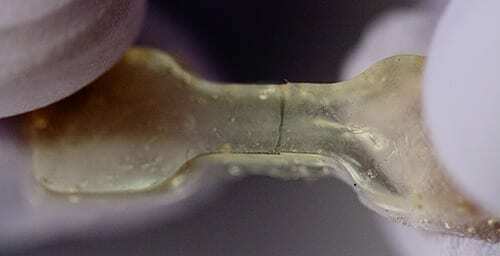 After the polymer is cut or torn, the researchers press the two pieces back together and let the sample sit for about a day to heal – no extra chemicals or catalysts required. The materials can heal at room temperature, but the process can be sped up by curing at slightly higher temperatures (37 degrees Celsius, or about body temperature). The polymer bonds back together on the molecular level nearly as strongly as before it was cut. In fact, tests found that some healed samples, stretched to their limits, tore in a new place rather than the healed spot, evidence that the samples had healed completely. The researchers use commercially available ingredients to create their polymer. By slightly tweaking the structure of the molecules that join up to make the polymer, they can make the bonds between the molecules longer so that they can more easily pull apart and stick back together – the key for healing. This molecular-level re-bonding is called dynamic chemistry.